Through a transparent exterior, the new Bell & Ross BR-X1 Chronograph Tourbillon Sapphire reveals a flying tourbillon combined to the sophisticated mechanics of a mono-pusher chronograph. 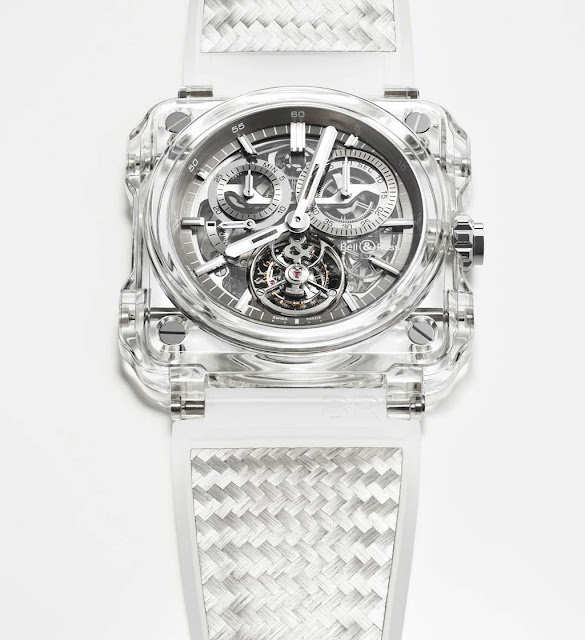 The skeletonizing of the movement and the transparency of sapphire allow the wearer to observe the column wheel at 12 o’clock and the other chronograph components in action. The mono-pusher at 2 o’clock controls the start, stop and reset functions. The 30-minute and 60-second counters are positioned at 10 o’clock and 2 o’clock respectively. 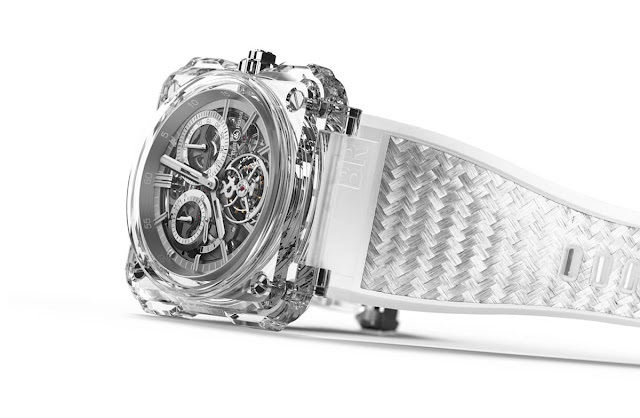 The power reserve differential and the barrel are visible on the back while the flying tourbillon cage can been seen from almost every angle. Not only extremely transparent, sapphire is also the second hardest material on earth after diamond and it is almost impossible to scratch. 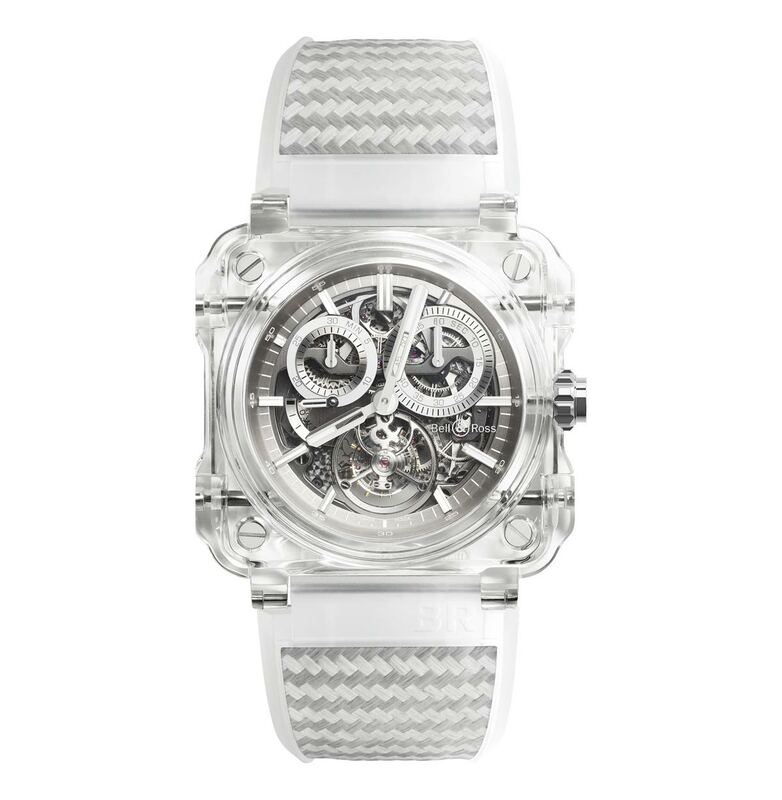 At the same time, its hardness makes the cutting of a watch case from a solid block of sapphire an extremely challenging process which takes many hours of machining and polishing. The BR-X1 Chronograph Tourbillon Sapphire 45 mm case is cut from six blocks of sapphire: middle piece, back, top, crystal and the two bumpers and it is assembled with screws. 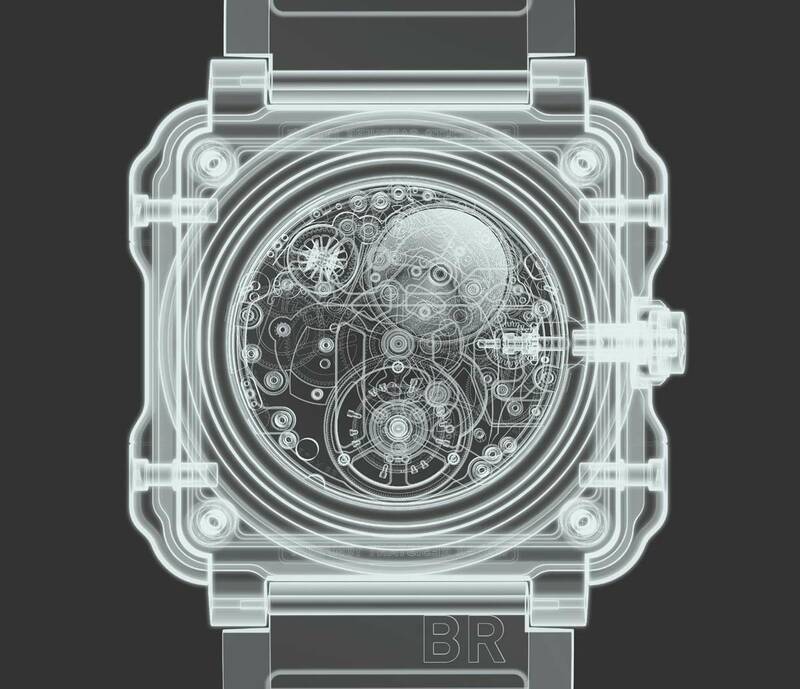 The hand-wound calibre BR-CAL.285 is comprised of 282 components and beats at 21,600 vibrations per hour with a remarkable power reserve of 100 hours. 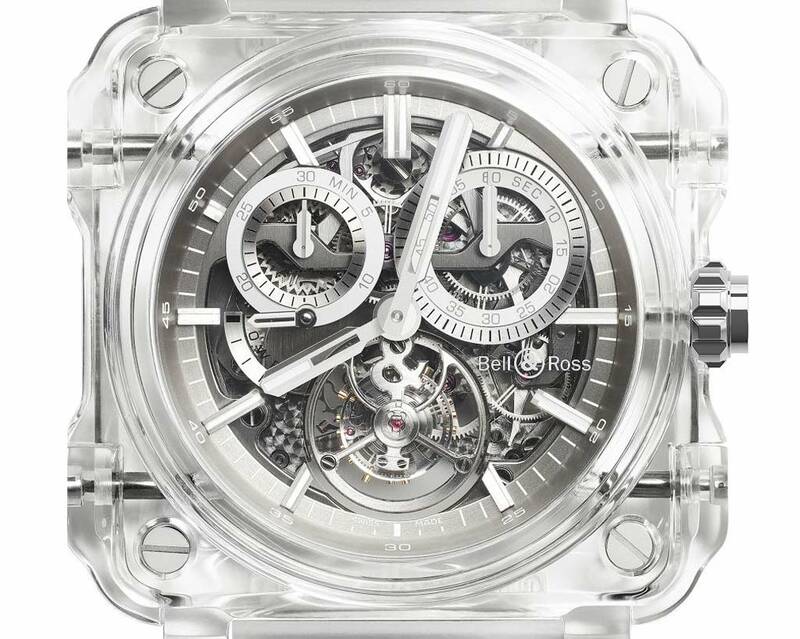 Bell & Ross - BR-X1 Chronograph Tourbillon Sapphire. 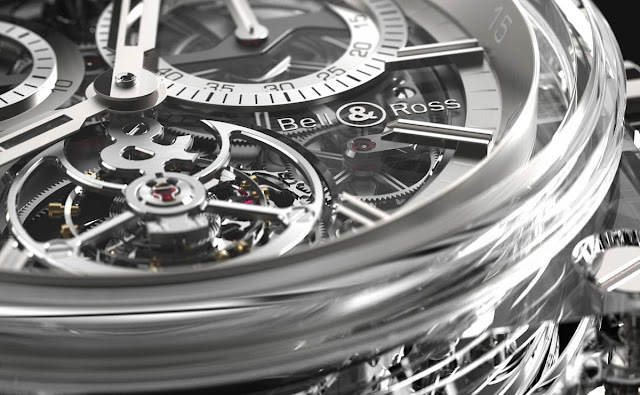 Through a transparent exterior, the new Bell & Ross BR-X1 Chronograph Tourbillon Sapphire reveals a flying tourbillon combined to the sophisticated mechanics of a mono-pusher chronograph. A limited edition of just pieces, the Bell & Ross BR-X1 Chronograph Tourbillon is completed by a bi-material strap combining translucent rubber with metallic Kevlar weaving. Price on request.